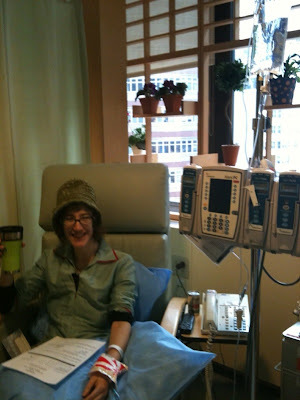 First day at the Chemo Suites, Sloan Kettering. My stepmother, L., accompanied me while Izzy stayed home with our Mary Poppins, Claudette. It is a comfort to know that he is well taken care of when I am not around. Friends and family have been taking him here and there and he has been having a great time. Yesterday he spent the day with his friend I., which saved the day since I had to see yet another doctor and today he had a playdate with my reflexologist he did art projects. Later on he and the Poppins did science projects. Back wait, back to me. While Izzy was gainfully amused, I was much less so. I spent my day getting blood drawn and having a most uncomfortable iv stuck in my wrist while the chemo drug, Paclitoxel coursed, through my veins, hopefully attacking any lingering evil cancer cells. It was a long day as the drip took over 3 hours. Surprisingly I felt hungry (probably the steroids?) and L. went and fetched us a great lunch from Le Pain Quotidian. While she was gone, I napped as the Benadryl and Xanax tired me out, and the fact that I barely slept three hours last night probably didn't help. So far I feel fine but tomorrow's treatment will probably change that. I will have Cistoplatin chemo inserted through a port catheter under my chest and 2 liters of fluids will be pumped through me as I lay on a bed for several hours. My great friend L. will accompany me and promises to get me through it. It is this procedure that is supposedly crucial to my treatment. Doubtful I will feel hungry tomorrow. When I returned home tonight, some great Indian food from my friend G. was awaiting and Claudette prepared fresh juice for me from our new juicer. Can't wait to post some recipes. Apparently she is an expert juicer. Stay tuned and send healing thoughts. i stumbled on to your blog today and read it for the first time. I'm a mommy too and my heart aches for your situation. Even though you don't know me, and I don't know you, I will be sending you good healthy vibes and wishing you the best. from one mama to another. Many Hugs and Love to You! You are such a trooper. Happy to see you posting again. Like @Jessica Goldklang, I just stumbled on your blog and I'm really touched. Not only for your battle with cancer, but also your thoughtfulness and passion for food. I will be coming back regularly to check on your progress. Many good vibes and smiles and perfectly cooked steak are coming your way from me. Thanks for all the warm wishes from new and old readers. It makes my day to read them.